What is a healthy, balanced diet? A simple question perhaps, but when faced with a barrage of food advice from friends, colleagues, celebrities, bloggers and the media it’s easy to feel unsure. This is where the eatwell plate came in, which for around 8 years provided the answer to this question. And I’m pleased to say that following some important developments the plate has received an evidence-based makeover so it can keep providing clarity in 2016 and beyond. First and foremost we needed to take last year’s Scientific Advisory Committee on Nutrition report on carbohydrates and health into account. This looked at the health impacts of the sugar and fibre we eat and concluded that the Government should halve our recommended intake of free sugars* and increase recommended fibre. This was the first wide ranging look at the relationship between carbohydrates and health in the UK since the 1990s and these reports are only produced when sufficient evidence emerges. I make this point specifically because we know that high-profile fad diets or sensationalist headlines give a false impression that “official” diet advice changes with the wind. This isn’t the case and the changes to the eatwell plate – now the Eatwell Guide, follows a comprehensive look at the evidence, consumer testing and input from an external reference group with health professions, industry, academia and third sector representation. Because getting it right is crucial – families make their own choices about what they eat but it’s our job to outline what a healthy diet looks like so they can maintain a healthy weight, get the right nutrients, and in turn reduce risks linked to poor diet and obesity, from heart disease to some cancers. I can best summarise our consumer research by highlighting changes which saw the new Eatwell Guide emerge as successor to the eatwell plate. Firstly, we found that drawn images (rather than photos) of food tested better with the widest range of consumers, and that people valued a little more detail than was previously appreciated. This led to the addition of information on food labelling and daily energy/calorie requirements. Whilst the majority of consumers we spoke to recognised the eatwell plate, the idea of a ‘plate’ with a knife and fork alongside it, no longer resonated. Our objective is to provide a guide to an overall diet, but for some people the plate/knife and fork appeared to be a guide to every single meal. A slightly controversial element of the previous ‘plate’ was the inclusion of some high fat, salt and sugar foods such as cakes and biscuits. From our consumer research we confirmed that, whilst this reflects reality for most people, people understand that we don’t need these foods in order to maintain a balanced diet but they would reject a visual definition of a diet that did not recognise these foods. The recommendation has always been, and remains, that they are best consumed infrequently and in small amounts so placing these products outside of the main image in the new design helped consumers reflect the need to move towards healthier choices. We were also pleased to see that the public understood that the foods on the plate represent the sort of options available. They are emblematic and represent the wider food group rather than deliberately excluding other products. Consumers from ethnic minorities also found the visual easy to use and relate to and didn’t identify a need for additional foods to reflect their diets or aid understanding. What else is new in the ‘Eatwell Guide’? You might notice that the segment sizes of the food groups have been updated. Segments were modelled using a technique called linear programming, taking the current intakes of the most commonly consumed foods in the UK (according to the National Diet and Nutrition Survey) and applying revised government dietary recommendations, modelling the fewest possible changes needed to achieve these. This hopefully ensures that the Eatwell Guide is not too far removed from the current dietary habits of the UK population and depicts an achievable way to a healthy balance. Whilst some consumers might like to identify an idealistic diet, behavioural insights tell us that making a recommendation that is largely unachievable would not be effective. The new guide differentiates unsaturated oils (such as vegetable/olive) and lower fat spreads from other foods that are high in saturated fat. These foods have been placed on the outside of the image with the foods high in salt and sugar. This is because some fat is essential but foods that are high in saturated fat, salt and sugar are not. And information on keeping hydrated reinforces the best drinks to choose; water, lower fat milk and lower sugar or sugar-free drinks including tea and coffee. Although fruit juice still counts towards one of your 5 A Day it has been removed from the fruit and vegetable segment of the guide and mentioned alongside hydration information. The crucial point to remember is that the act of juicing or blending fruit releases the sugar so that it is ‘free sugar’. It’s better to get your five a day by eating whole fruits and vegetables. 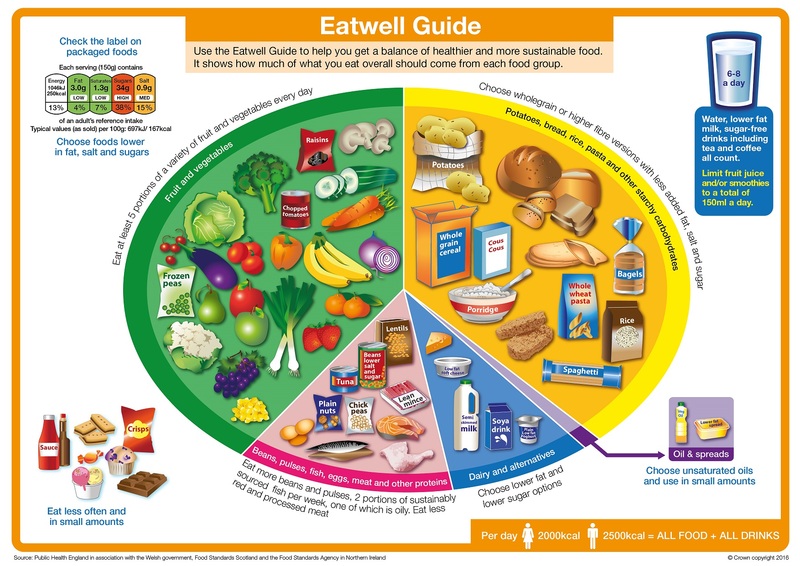 The Eatwell Guide now has sustainability messages and the names of some of the food group segments have been updated to place emphasis on food products within a food group that are considered more environmentally sustainable. The act of juicing or blending fruit releases the sugar so that it is ‘free sugar’. It’s better to get your five a day by eating whole fruits and vegetables. For example, the pink segment of the Guide is named ‘Beans, pulses, fish, eggs, meat and other proteins’ to highlight the contribution non-meat sources should make to the diet, as these products are lower in saturated fat, higher in fibre and help to reduce diet-related ill health such as heart disease and some cancers. It’s important to reinforce again that the Eatwell Guide has a single important objective. Using the best possible evidence and expertise, we want to provide simple, trusted advice to help people make healthy choices. Professionals should start using and referring to this new version, schools will receive copies and high resolution images for download can be found on GOV.UK. And for the public, the relevant NHS Choices pages are there to provide food for thought! There is also an Eatwell Guide booklet which provides consumers with more information about eating and drinking healthily. Our clear message is that by choosing a diet that reflects the Eatwell Guide, you are making the best choice for your health. *‘Free sugars’ means any sugar that’s added to a product by manufacturers, cooks or consumers or the sugars naturally present in syrups, honey and fruit juices. Free sugar doesn’t include sugars in fresh fruit and vegetables or dairy products. Oh my word! This is what the world's nutrition authorities have been recommending for the last forty years. Forty years during which we have seen the rise of epidemic levels of obesity, Type 2 Diabetes, Alzheimers, etc. Isn't it time to recommend a diet that addresses the root causes of those problems, i.e. high blood sugar and hyperinsulinaemia caused by too many carbohydrates in the diet and an imbalance of omega 3 and omega 6 fatty acids caused by consumption of vegetable oils and spreads. Completely agree with you Frank....how many more years is it going to take this government to get it right! The way forward is very simple....Unprocessed, healthy soil, healthy animal, freshly picked! You don't need a plate or a guide to remember that! Yes I'm sure changing from photos to pictures is going to make all the difference and reduce the strain on the NHS instantly. How much contribution was made to this new 'guide' from food companies I wonder? I think that the best diet is of blue zones.